The Getty Center’s “Sounds of L.A.” series is aimed at showcasing the Southland’s extraordinary range of creative talent. And that franchise was in full blossom Saturday night with the appearance of singer Mamak Khadem. Perhaps best known – until now – as the remarkable voice driving the cross-cultural ensemble, Axiom of Choice, Khadem has also been heard in numerous film and television sound tracks. 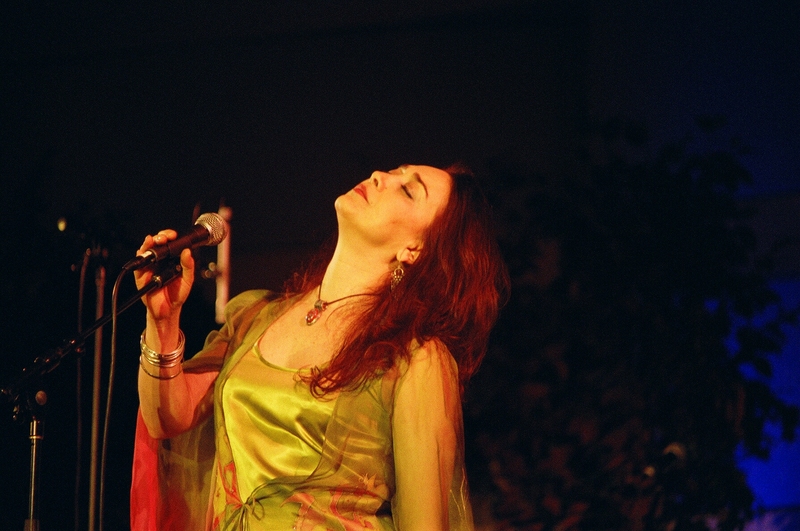 She began to step out on her own as a solo artist with the release of her first CD, Jostojoo: Forever Seeking, and her performance in the Williams Auditorium at the Getty Center (which was repeated on Sunday night) revealed an artist with the imagination, the musicality and the presence to quickly rise to the top level of the World Music genre. The slender, auburn-haired Khadem’s roots are in the Persian music and poetry of her native Iran. But her interests also reach out to embrace the cultures of Turkey, Armenia, Greece and beyond, as well as the classical music of India. Further enhancing the rich lyrical and musical complexities of her art, the songs she sang were framed in multi-layered instrumental textures by her five piece ensemble, sustaining the music’s traditional aspects, while adding colorful new perspectives. At the center of it all, Khadem’s voice was an instrument of wonder. Reaching from dark, velvet timbres to airy head tones — winding gracefully through melodic ornamentation, embracing subtly shifting dynamics, glottal stops and arching melismas — she applied her remarkable vocal technique to poetic phrasing that transcended the specificities of language. A pair of romantic love songs – “Gelayeh” (from Baluchistan) and the Kurdish melody “Avareh” – provided effective vehicles for Khadem’s most intimate renderings. But a duet beautifully sung with her husband, santur player Hamid Saeidi, in the song “Bigharar” (“Restless Yearning”) from the Iranian province of Fars, was the romantic highlight of the program. In addition to Saeidi, Khadem was backed by keyboard player and music director Jamshied Sharifi, clarinetist/saxophonist Ole Mathisen, oud player Dimitris Mahlis and percussionist Chris Wabich. On one number she was joined in song and dance by an enthusiastic group of her students. Together they created a splendid musical evening. One hopes that Khadem – who lives in Los Angeles – will now be heard more often in the Southland as her career arc continues its upward track.